Water and ink, think about their relationship with each other. Ink is obtained from the tree; water is the life of the tree. 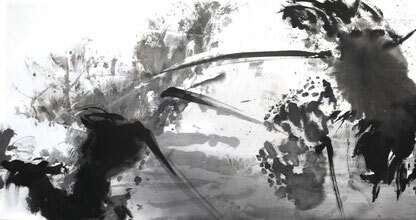 The communication which develops among humans and nature forms the ink painting. The relationship between the ink and the painter is similar to the relationship between the dream and the soul. From ink spawns limitless life… When climbing a mountain, do you feel excited for those stones beneath your feet which have existed for billions years? When gazing upon ancient ink paintings, do you feel the breath of their creators? Since antiquity, the Chinese have found and used ink to create paintings. This is not an accident, as ink paintings are closely bound to the mind of the Chinese and has become linked to their culture. An ink painting must possess Eastern thought. If you are using the proper materials but are painting with a Western humanities mindset, it will never be a true ink painting. Ink painting is like another life. With Eastern thought, whether porcelain, fireworks, or music, a common origin is expressed. The contemporary 'New Ink' style is only 'new' in that it is a style designed for a capitalist society, created in order to be consumed. For a true 'New Ink' style to emerge, the East must absorb its own cultural origin and further develop Eastern thought in order to rebuild expressions. Ink painting in my heart is characterized by two attributes: embedded within is a rich spirit as well as eternal life. Fantasy and reality, extinction and existence, are all combined. With ink paintings, I am happy to imagine and happier to understand. Ink paintings are not limited to black, white, or any particular color. They are colorful in one's mind! According the statements above, all of my artworks are ink paintings in spirit! In reality, however, my ink paintings are on paper, on canvas, and on silk fabric.